Dubai’s Eco-Disaster: India’s Lesson ? Dubai may have managed to pull itself out of a quagmire of debt, but its troubles are far from over. Back in November 2009, when Dubai World, Dubai’s government-owned investment company, announced its mammoth debt totalling $59 billion, creditors all across the globe felt a frisson of dismay: Dubai’s economy was sinking. One year (and a few months) on, its “The World” islands too are headed that way, quite literally. These man-made islands, built by land reclamation process, have reportedly shown “erosion and deterioration”. In other words, “they are gradually falling back into the sea”, even as the project remains largely unfinished, due to a pause in the construction work caused by Dubai’s massive debt crunch and the global economic downturn. 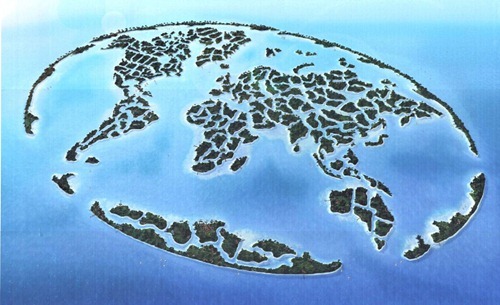 “The World” is one of the many land reclamation projects undertaken by the Emirates city-state – the others being Palm Jebel Ali, Palm Jumeirah, and Palm Deira, with the last one intended to be the biggest of them all. Land reclamation projects to build these artificial archipelagos, have proved to be disastrous for the surrounding marine ecosystem, with environmentalists all around the world crying foul as in the line of fire are coral reefs and oyster beds – the sand dredged up from the sea floor have reportedly buried the coral reefs along the Gulf coast. Reefs are known to harbour and to provide protection to various marine species and damage to a healthy reef can lead to loss of commercially viable species of fish, which in turn can mean huge economic losses for the fishery industries. Furthermore, the loss or the subsequent extinction of even a single species can cause the disruption of the delicate balance of the ecosystem. Reefs also play a part in protecting the shoreline from strong sea currents, by acting as a buffer and thus preventing major property damage along the sea-front. Though environmental scientists at Nakheel, the real estate arm of Dubai world and the developer of this project, have sought to address this ecological issue by building artificial reefs at new locations, ecologists believe that it might not be enough. As far as conservation of marine flora and fauna is concerned, Indian policy-makers are way ahead of their Saudi Arabian counterparts. Major coral reefs in India are found in and around the Gulf of Mannar, the Gulf of Kuchh, Andaman & Nicobar, Lakshadweep Islands and coastal constructions are regulated under the Coastal Regulation Zone (CRZ) Notification (1991), which is revised from time to time. As per this, certain activities in the Coastal Regulation Zones (CRZ), such as “discharge of untreated wastes and effluents from Industries, cities or towns or other human settlements” , “dumping of ash or any wastes from thermal power stations”, and land “reclamation for commercial purposes” like shopping and housing complexes, hotels, etc, are strictly prohibited. However, it is yet to be seen whether the CRZ laws can help preserve India’s marine environment or not. ICC Cricket World Cup 2011 – What’s up for Sale? thanx sri 4 the info, nowadays v people r busy in exploiting every thing & anything of the mother nature 2 fulfill our greed, without thinking of the future what we have to pass on 2 the coming generations. we, should spread this kind of knowledge by all means & INDIA should not follow other countries footprints blindly, we should fulfill our requirements keeping in balance with nature. i would like 2 attract your kind attention towards the blind colonisation on agriculture land. nowadays the fertile land have been very swiftly converted into concrete jungle covering our fields, the one big reason 4 the current inflation in the vegetable & food items price rise is the fertile cultivable land is cut into plots & colonies are covering them entirely . our govt. should make new townships or colonies in some barren or otherwise not so fertile lands & the landbank should be used wisely as it is also limited. Destruction of agricultural land for infrastructure development is a grave issue indeed. I do realize that as writers, it is our responsibility to inform and enlighten the masses. Thank you for bringing this topic up. Just proves that no matter what Nature always wins. It was all an ego trip which was sure to crash land. Yeah, it is their worst nightmare – which is why Dubai is busy revving up its tourism industry by pumping millions of dollars in it. It is their only hope because once the oil sources deplete, there will be hardly anything left to sustain their country’s economy. Hey, a non-linkbait article for a change :). Good job! As they say most of the ecological disasters that would embrace the Earth from now on wouldn’t be natural disasters; but nature’s way of depicting fury against man-made disasters. Thanks… and yes, I totally agree; though these islands are engineering marvels, man cannot defy Nature for long. Actually, just because the islands are man-made, doesn’t necessarily mean they have to sink. A number of land reclamation projects, around the world, have been completely successful. For instance, the Hong Kong International Airport (HKIA), voted as the World’s Best Airport in 2007, is built on a largely artificial island reclaimed from the mountainous islands of Chek Lap Kok and Lam Chau. The airport is reportedly capable of handling 45 million passengers and three million tonnes of cargo a year, and there have been no reports of it sinking.